The sight of the Qutab Minar, the tallest brick minaret in the world, on a sunny winter morning is nothing less than perfection. The lush green lawns around it, the spick-and-span streets, and the hustle and bustle around this ancient monument set the mood for sightseeing the entire day. A group of schoolchildren on an educational trip, families on a picnic, and foreigners intrigued about the rich Indian heritage – all can be seen admiring this UNESCO world heritage site. 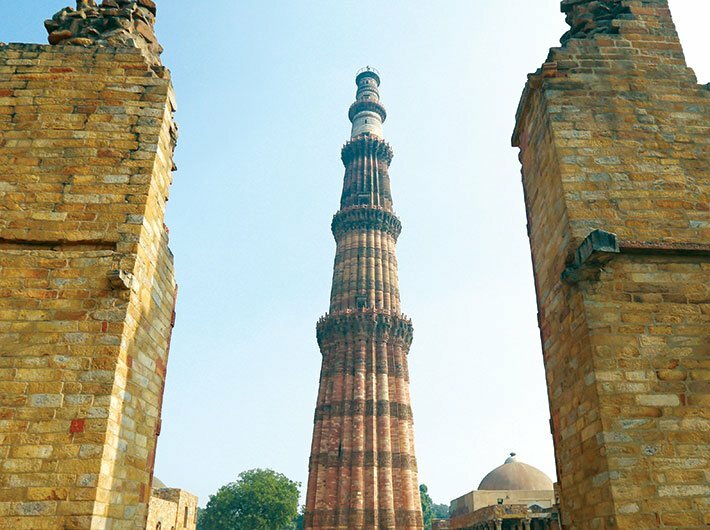 Soaring to 73 metres, Qutab Minar stands tall in the heart of Mehrauli, south Delhi. But unlike its counterparts in other parts of the national capital, Qutab Minar sets a notable example in cleanliness, across outside to inside. Right in front of the main gate, vendors sell local delicacies and mementoes inside the Qutab complex. They are serious about keeping the place clean. A dustbin is placed at every shop, and shopkeepers have developed the habit of politely asking their customers to throw waste in the bin. “Qutab had always been clean, but still a lot has changed in the last four to five years since ITDC (India Tourism Development Corporation) came here. The monument has become more beautiful,” says Shyam, a vendor at the complex. In 2012, ITDC took the initiative of maintaining cleanliness and upkeep of historical monuments. The idea of ‘swachh smarak, swachh paryatan, swachh Bharat’ (clean monument, clean tourism, clean India) was first floated by Lalit Pawar, former director of ITDC, in 2011. But first, the government-run corporation had to plead with the Archaeological Survey of India (ASI), the government agency responsible for conservation and preservation of cultural monuments in the country, to give a go-ahead. Vidyut Gautam, who worked closely with ITDC since the beginning of this project, says there were certain notions that had to be changed. “In 2011-12, tourist arrivals in China rated 5.1 (on a scale of 10) whereas India was rated 0.46. Apart from this, there was a brand value we had to develop. Foreign tourists here often complain of upset stomach because of unhygienic food, water and surroundings. They have even given it a name – Delhi belly. We had to work on erasing such notions. We focused on the facts and convinced ASI that there is an immediate need for a campaign like this,” says Gautam, who was the project manager of the cleanliness campaign till 2016. ITDC had to choose from the hundreds of monuments in Delhi to zero in on a pilot project. “Red Fort or Old Fort was too big for a pilot and Tughlaqabad had no footfall. So we wanted a project that was neither too big nor too small while at the same time challenging enough for us to carry out this campaign. Qutab Minar fit the bill. Another reason was that ITDC’s headquarters is in Delhi, so we were giving priority to a monument in Delhi,” he says. The cleanliness drive at Qutab Minar is one of the biggest initiatives taken by ITDC under its corporate social responsibility (CSR) activities. Piyush Tiwari, director, ITDC, says that tourism contributes seven percent to the GDP and nine percent to the total employment in India, and that it’s a big source of foreign exchange as well. But somehow, India gets less than one percent of foreign tourists in the world. “One of the reasons why they avoid coming to India is for their perception about hygiene and cleanliness. When it comes to those things, India ranks beyond 100 globally. The purpose is to change the perception of the world towards India and what better way than representing our rich heritage. We have to bring it to that level. But ITDC had many challenges ahead,” says Tiwari. The first challenge, and a major one, was to adopt a plan and devise a strategy that would not interfere with the art and heritage of the monument, as that was the condition put on the table by ASI. The next hurdle was to bring all agencies concerned, like ASI, municipal corporation, Delhi jal board, tourism board and traffic police, on the same platform. “We had to make them understand that there will be changes and that ITDC is here to only help and guide with those changes. For example, the Delhi jal board was confused as to what role they have to play. We told them that the pipeline might need repairing and the taps installed in Qutab Minar need to be checked. The traffic police was asked to manage vehicles and local shopkeepers, in a manner that the area looks clean and in order. So we had to work on these little things,” says Gautam. The selection of dedicated manpower on the field which would devote its time and energy in the campaign also took some time. ITDC held several interviews of local boys and after careful consideration hired them and trained them. The process, that took six months, also helped in employment generation. Initially, one supervisor and 11 staff members were deputed to sensitise visitors, and clean litter at the Qutab Minar premises. This continues even today, only the number has reduced to eight. This is in fact a measure of success, because there is less work now than before. The staff has been trained by ITDC on how to talk and educate foreign as well as Indian tourists on cleanliness, in a way that is polite yet firm. Work was also allotted to engineers for one-time repair of toilets, installation of signboards in and around the monument, providing garbage bins, repairing and replacing light covers and also working on colour coordination of the railings with the surroundings. ITDC also roped in Prayas, a voluntary group, to carry out the sensitisation drive for the staff, local shopkeepers, vendors and others. Awareness campaigns in the form of door-to-door counselling, interactive sessions, nukkad nataks, distribution of pamphlets, were carried out in nearby areas. Four years down the line, ITDC has been able to create a visible change. ASI officials at Qutab Minar feel that ITDC’s efforts have changed things for the better as there is now a sense of belongingness among the locals about their surroundings. “Qutab has always been clean but one thing is for certain: the attitude and mindset of the locals towards maintaining cleanliness has evolved with time. They themselves take the initiative of keeping the premises clean; such an attitude did not exist earlier,” says Satender Singh, junior conservation assistant at Qutab Minar, ASI. The tourists too are welcoming the change. “Half an hour ago, I dropped a wrapper on the floor and one of the boys from the cleaning staff picked it up and threw it in the bin, placed just next to me. He then politely asked me not to repeat the mistake and showed me one of the signboards (urging the public to keep the environment clean). These signboards act like a warning for us. Honestly, I was a bit ashamed with myself but also impressed by what the staff was doing,” says Vinod, a Delhiite who had come there with his family. After the success of their pilot project, ITDC went a step ahead and, on October 2 last year, adopted two more monuments – Red Fort and Purana Qila – as part of their campaign. This time the same procedure would be followed but on a bigger scale. “The footfall at these two forts is much more than what we witness at Qutab Minar. There are Independence Day celebrations at Red Fort and this makes the job even more challenging. However, we no more have to convince any of the government agencies as now they have complete trust on us. We will continue to keep them in the loop,” says Gautam. Qutab Minar is a start. As more monuments would come under ITDC’s ambit, the rare monuments would soon have a chance to redeem their lost glory.